Okay, this will be an ongoing series of posts that evolves from a VERY simple migration to a more difficult migration. We'll start off with the most simple scenario. In order for this to be the most direct, most simple migration possible, the most CRITICAL piece is that the path to your content remain identical. Sadly, this means if you're using the default paths on XP and are moving to a Windows 7 machine, you won't be able to follow this tutorial (yet?). So here's what I've now actually done. It worked for me, hopefully it will work for you. * The full path to where each version of DAZ Studio 4 is installed. * The full path to where the DS4 Default content is installed (which should be part of #1 above, but since it's called out by the installer explicitly I'm repeating its need here). * The full path to where the Content Management Service is installed. * The full path to where the CMS Databases is specified. * Where DS4 is installed? The first thing I did was copy all my content from the Old Computer to the New Computer. I did this over my LAN, but copying via a USB device should work too. Repeated for the 64-bit install adjusting the path to "64" where needed. Once the data copy was completed... I installed DAZ Studio 4 pro 32bit. Repeated for the 64bit install adjusting the path to "64" where needed. Now once all the installs are done it's time to finish copying stuff! * STOP the CMS service, using the start menu shortcut. * START the CMS Service, using the start menu shortcut. Now, launch DS4 for the first time. (32bit or 64bit doesn't matter, I did 64 fwiw). * You will be prompted for your DS4 serial number. Go ahead and put it in. * You will be prompted for your DS4 plugin serial numbers. Go ahead and put them in. * You will be prompted for a tutorial. Go ahead and close out of that. * You will be prompted to select your layout. Go for it. I chose City Limits. 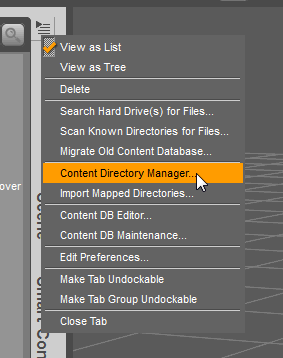 Before you do ANYTHING else, go to Edit > Preferences > Content Library and click the Content Directory Manager button. 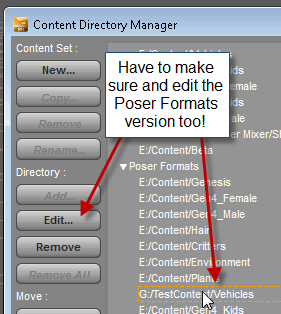 * Add each Poser Format directory. * Add each "Other" Format directory. Now be brave. Click on your Content Library tab and go to Categories. Everything should be there. Now, let's tackle the scenerio where the paths of everything gets changed. e.g., changing a drive letter. 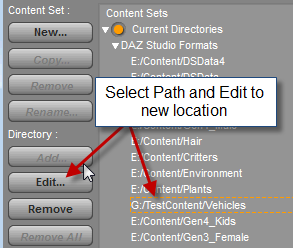 The previous tutorial still applies, but you change the location of the content / copy destination to its new home. HOWEVER, you must specify the paths of your content incorrectly. This will often mean that you can't do this easily because the incorrect path MUST exist. This may mean you have to use a USB key (and assign it an appropriate drive letter, etc.) or other means that are too technical to go through here. Okay, so the first thing to do is specify the new path. Now see how it matches? 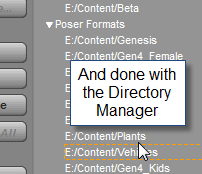 Once that's done for each bad path you're done with the Content Directory Manager and can Accept/OK out of it. First, find an item with a bad base path in the CMDB... You'll know it by the big yellow exclamation point! 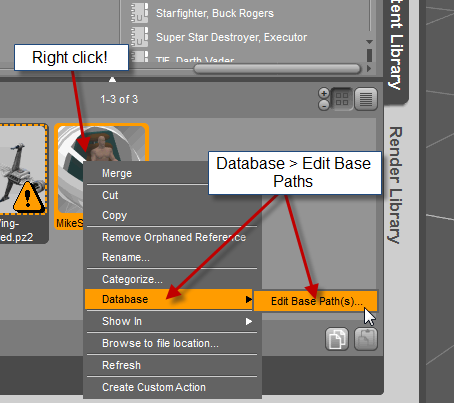 Now right click on any one of the bad items, select "Database" and "Edit Base Paths"
Click the top drop down and select "All files using this base path"
It may take several minutes for this to happen if your database is quite large though the dialog will disappear almost immediately. Please give it some time before exploring. I recommend about 5 minutes. Repeat for each other base path that changed and you're done. Q: Can I use this process to "backup" my CMS Databases? A: Yes, but you only need a tiny portion of it. Basically, you make certain DS isn't running, you stop the CMS, you copy the contents of your databases folder to another location, restart the CMS. I've made a batch file to help with this. It will need to be edited to reflect the appropriate path of your CMS database files. Just make a file called "Database Backup.bat" and open it in notepad, put the code in there, edit it appropriately, and save it. Then you can just double click the Database Backup.bat file and it'll do the backup. net stop "DAZ Content Management Service"
xcopy /y "E:\DAZ\Content Management Service\databases\*. *" "E:\DAZ\Content Management Service\databases\backup\"
net start "DAZ Content Management Service"
Q: I wondered if this method, or something very similar would work for moving My Library to an external drive. A: Yes. Make sure the installations of content are identical. Make sure that all the same plugins are installed for DS. The How: Ensure DS isn't running. Stop the CMS. Cleanly eject the external drive. Attach to new computer. Start the CMS. Remember to stop the CMS before disconnecting the drive, etc. I moved my content folder to another drive, and I have updated the paths via the “content directory manager.” Everything looks good at this point. 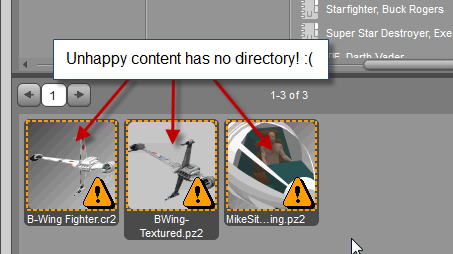 My content library still shows all of my content and the path information is correct when I select a file. Now, as expected, my content database now has exclamation points over everything. Per your instructions, I right-click, select database/edit database paths. I hit accept, and nothing happens. When I went in to try again, it had defaulted to a base path of “C:/ProgramData/DAZ #D/My DAZ Library. I am running Daz 4.5.0.90. Is is possible that a necessary directory is set to “read only”? If so, does anyone know where it might be. After reformatting my computer, I first made sure that everything was restored to its original location and confirmed that all of my content database categories showed up correctly. Next, I copied my content onto another drive (I am trying to lessen the burden on my OS drive) with the intent of updating the database base path via Daz Studio. 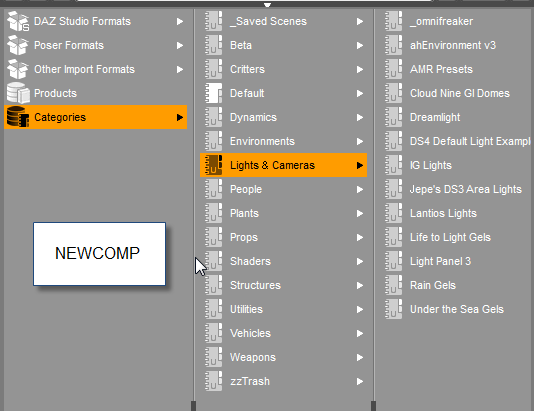 I also updated my content directory manager to point to F:\DAZ 3D\Studio3\content, and I do see all of my files in their expected directories, just not the database categories. See image 1. C:/Program Files/Daz 3D/DasStudio4//runtime/libraries/character.... (and yes, there are two backslashes before runtime. Seeing this, I assumed that C:/Program Files/Daz 3D/DasStudio4/ was a base path. 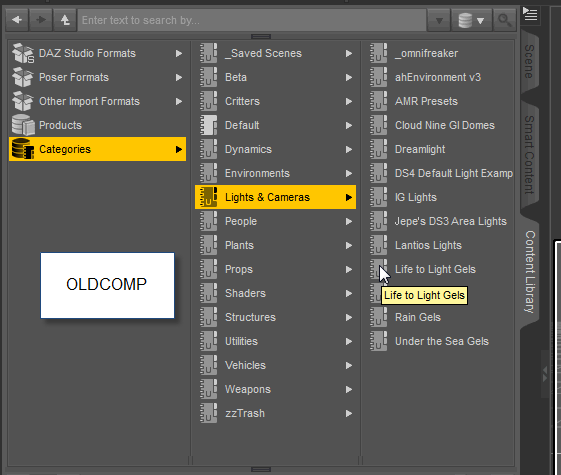 So I right-click on the icon, and selected database/edit base path(s)... See Image 2. As you can see from the image, the base path given does not match what I saw for the file path. Nevertheless, I attempted to modify the base path. See Image 3. 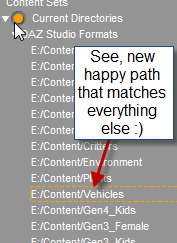 So in image 3, you can see that I chose my new content path and indicated that I want all files using this base path be changed to the new base path. However, after hitting accept nothing seems to happen. When I select database/edit base path(s) again, I see that it has gone back to looking at AppData/Roming/Daz 3D etc from image2. I've tried going back to my original content paths, but same result. I'm really stuck on this one. Is there anything else I can try for the sake of troubleshooting? I have the exact same issue. 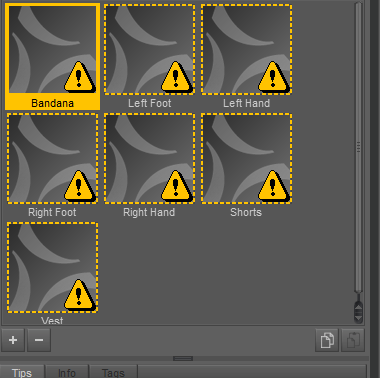 Nothing happens when I select "All files using this base path" option and click accept. God, I have the same problem after moving one Runtime to another disk with DS 4.8. I can't believe that this bug hasn't been fixed after all this time . This is just ridiculous. I suspect this isn't a bug but the way the content was installed. Where does DS think the content is, and where is it really? Here is how I fixed this issue. I created a temporary product including all the assets from the Runtime I moved (50000+ items by the way....). Now all the broken linked assets have a dual path (old + new path). Then delete the product and remove all the orphan references on each product affected by the change of the Runtime path. Took me more than 1h30 but now it seems Ok now.